By the generosity of Poseidon, I had the opportunity to setup a really big 1100 litre planted aquarium for Avion Holiday Resort in Lonavla. This is one of two aquariums and a pond at the resort. Lonavla is a hill station and the drive there from Bombay goes through scenic elevated routes. You come across several mountains facing each other while hiding a green valley in between. And the entire region transforms into nature’s paradise in the monsoons. It was this exact spirit that we pursued to embody in the aquascape. So after months of designing and planning, the aquarium was setup in the winter of 2016 over a span of 4 days. Here is a journal of this tank’s journey. 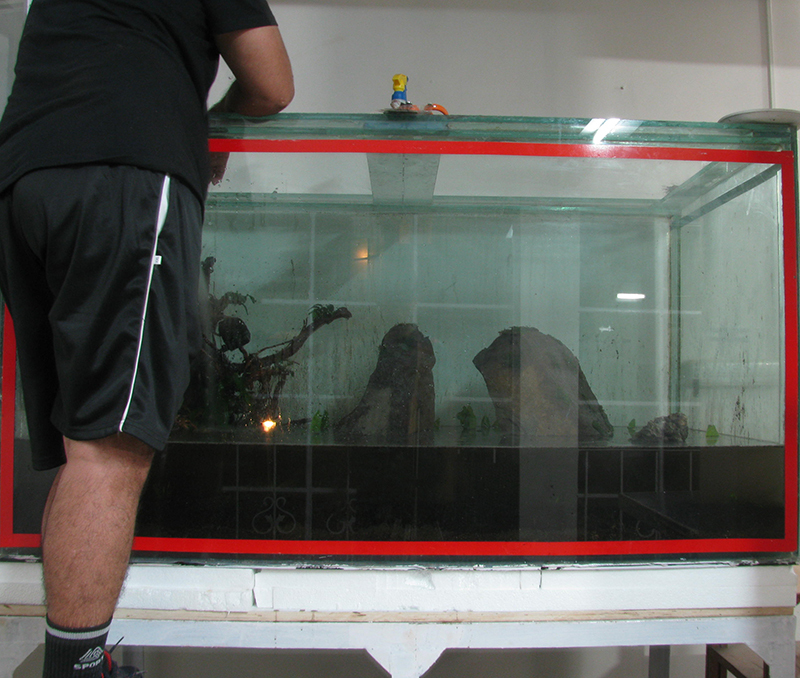 Situated in game room of the resort, this tank originally housed a good number of monster-sized fish; including a 3’+ Alligator Gar, ~3’ Silver Arowana, Giant Gourami, and Tiger Sharks. These fish had been put in there when they were small a few years back. And by 2016 they had totally outgrown the tank. So the first step was to transfer these guys out. Luckily the resort had a large pond that would be perfect for them. However the challenge was to take these beasts out of the tank. The staff had previously tried and failed at it. 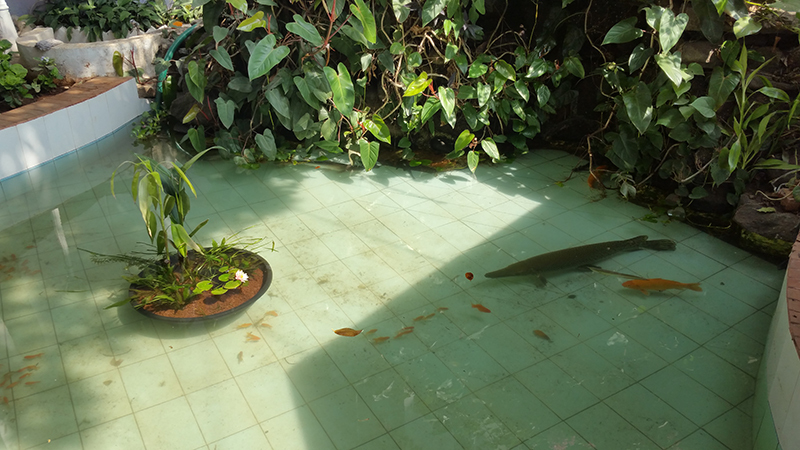 The Arowana and Gar would completely panic as soon as they sensed any attempt to catch them and lash out in the water. We then tried to commission Aquanature and Nautilus for this job. But they refused to take it up after realizing the riskiness of the situation. So finally, we took it on ourselves to get them out. We put on our Breaking Bad hats on and figured out how to tranquilize them using Clove Oil. It took some time to calculate the concentration required for this variety of giant fish. And it ended with an adventurous two hours of knocking out the fish, jumping in the tank and pulling them out, taking them into the pond, and then pushing them around like toy-trains in water till they were able to swim on their own again. Whew! That was really something. After that memorable ordeal, the tank was buffed up for its new look. The stand was elevated a few feet higher to horizontally align with the viewer’s eyes. The Styrofoam sheets at its base were replaced. We went hunting for rocks in the wilderness of Lonavla. After lots of searching a few ideal stones were shortlisted. But boy were they heavy. 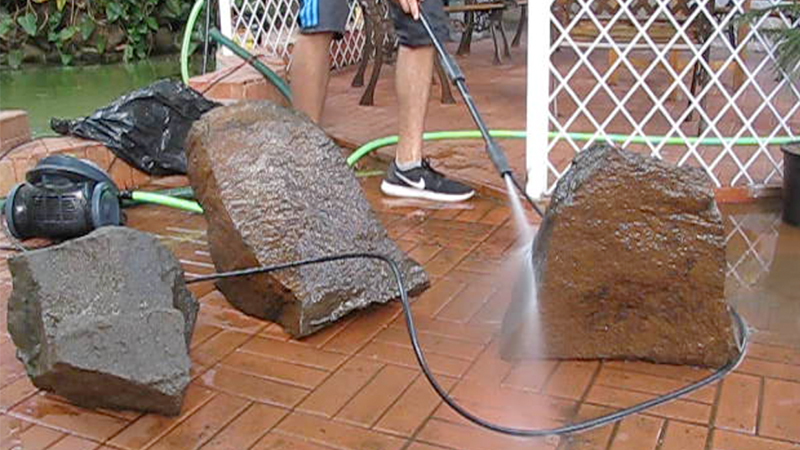 They were thoroughly washed before being placed into the tank. 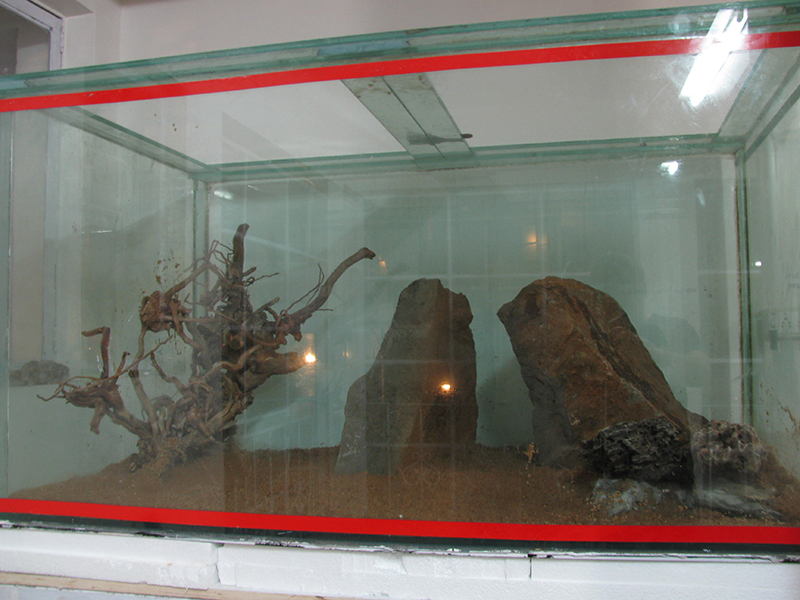 Two stones were finally selected for the aquascape. They were positioned to resemble two mountains facing each other with a steep valley between them. The golden ratio was followed in their placement. The keystone was placed in a 1:3 ratio position on the right side. The secondary stone sank well in the centre. 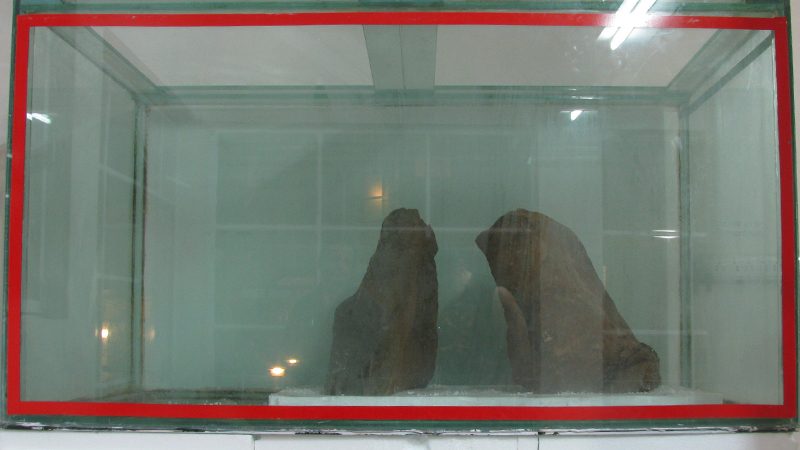 Due to the heavy weight of the stones, they were placed over thick Styrofoam sheets inside the tank to prevent any damage to the glass floor. The tertiary elements were added next. These compromised of driftwood and dragon stone. A thin base of gravel was added as well. A commercial powder to kick-start the bacteria colonies and speed up the cycling process was added. The powder was also added into the new filter. 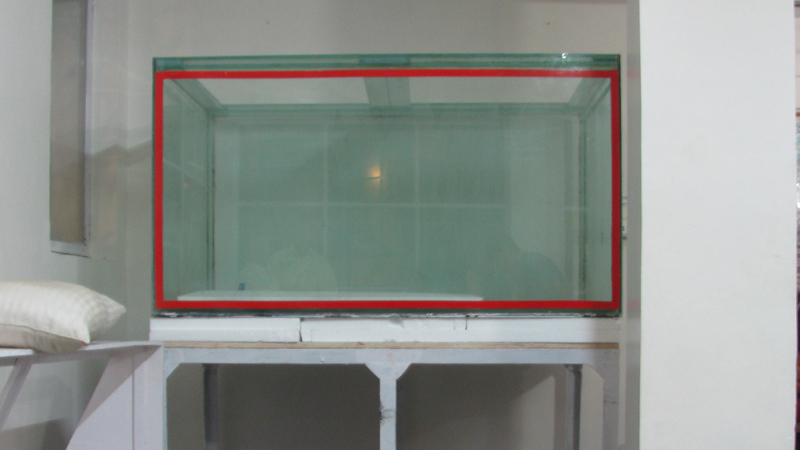 This would allow us to add the fish into the aquarium the very next day without any issues. The driftwood was stacked and tucked at the back to create a tall structure. This driftwood structure would eventually get overrun by plants, and would no longer compete with the primary and secondary stones. The tall nature of the driftwood would also serve the functional purpose of serving as a safe zone for fish swimming in the mid and top zones of the aquarium. Thereafter a 5-inch layer of ADA Amazonia was poured in. ADA Amazonia contains all the nutrients required by the chosen plants for a few years. It also releases CO2 for an initial period to boost their growth. Once the substrate was evenly spread, a few inches of water was poured in to allow for easy planting. The plants were carefully planted in. Since the planting process would take well over an hour, we had to periodically spray the exposed plants with water to keep them from drying. Finally, the water was flooded in gradually. Ecstatic and exhausted, we called it a wrap at around 3:00 am. 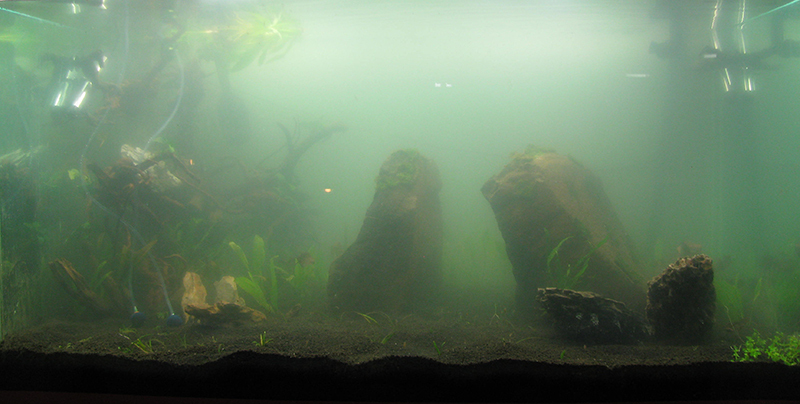 The tank stayed murky for a few days, but eventually cleared up. To watch on YouTube in 1080p, click here. Like the monster giant fishes and also the setup...... .....also climate will be excellent in lonavala from now onwards for planted tank. @Rahul_Discus Thanks man! The climate in Lonavla is actually quite hot these days. It gets ideal from the monsoon onward. Currently the tank's water temperature is at 32C (it's not in an air conditioned room). That's why all the Xmas moss that was there on the rocks in the initial pics has completely disappeared. There is a limitation in selecting plants, fish, and shrimp that can only survive in such high temperatures. Otherwise would have loved to put in some Crystal Red Shrimps in there.